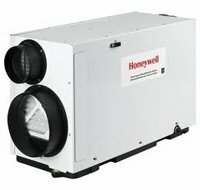 The Honeywell Dehumidifier is marketed by the well known Honeywell Company (Honeywell International Inc.). Honeywell is literally a household name because of the widespread use of Honeywell thermostats in many of our homes. Other product ranges that are familiar include Garrett turbochargers and the Prestone, Fram and Autolite brands of automotive products. So well known is Honeywell that when the company was acquired by Allied Signal in 1999 the merged company chose the name "Honeywell" as its title since the brand was so much better known, even though Allied Signal was a company twice as large. 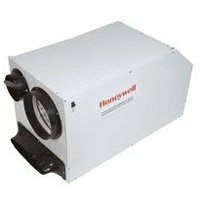 What may be less well known is that the three whole house dehumidifiers distributed under the Honeywell brand are manufactured by Therma-Stor, familiar for their "Santa Fe" range of basement and crawlspace models. Therma-Stor manufactures its own branded range of whole house units under the name of Ultra-Aire and three of the four Ultra-Aire models correspond very closely with those in the Honeywell range. It is a compliment to the quality of Therma-Stor products that Honeywell markets them under its own name, a name that itself is associated with quality. Therma-Stor manufactures some of the finest of these appliances available anywhere and although they may be equalled there is nothing better on the market today. The Honeywell TrueDRY DR65 is the least powerful in the Honeywell TrueDRY range and will control humidity throughout a smaller home with a total area not exceeding 1800 square feet. Whole house dehumidifiers are designed for ducted installation so that moist air can be drawn from each individual room in your home and replaced with drier air. This can be achieved through the installation of dedicated ducting but it is more usual to integrate the appliance into your existing HVAC system, making use of the ducting already in place. The TrueDRY DR65 is equally effective operating in stand-alone mode in a single enclosure, such as your crawl space or basement. The Honeywell TrueDRY DR90 is a much more powerful unit than the DR65 and would be the unit to choose for a home of up to 2800 square feet. Like all of the TrueDRY range this unit can be located almost anywhere in your home. Typically it will be installed by your furnace but could equally well be sited in your attic if this is more convenient. Large dehumidifiers are louder than typical portable models so the opportunity to place the unit where that noise will cause the least nuisance is a major advantage. If the best site is in your basement the continuous drainage may be directed to your sump, a convenient and tidy arrangement. For yet larger homes, up to 3600 square feet, the most powerful unit in the range, the TrueDRY DH150, provides the answer. In addition to humidity control the DH150 has the capacity to improve the ventilation in your home, replacing the moist interior air with fresh, outdoor air. Most airborne particles, including mold spores and pollen, are removed by the MERV 11 filter built into the appliance. 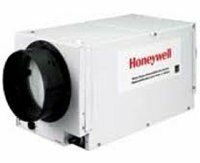 Like all of the TrueDRY range this Honeywell Dehumidifier is built to work effectively in the cooler conditions of a basement, the most common site for a whole house unit. This capability for low temperature operation makes the DH150 equally suitable for use, with or without ducting, to control humidity in a large basement. Honeywell Dehumidifier - This Works. I have several customers that use Honeywell and rave about how well it operates. On their word as a dealer I have put one in my home and can not believe how well it performs. Best add on I have ever purchased.